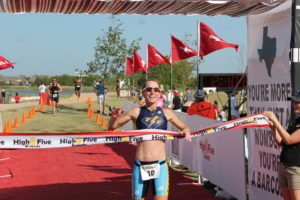 On Thursday, November 10th, William Dyson, of High Five Events, sat down with Desiree Ficker Berry (see extensive recognition list below) to discuss her acceptance into the Austin Marathon’s Elite Athlete Program, her ability to balance family life and training, and what her goals are for the future. Follow Desiree’s journey to the Austin Marathon start line on Facebook, Twitter, and Instagram. William Dyson – You were one of the first runners selected for the Austin Marathon’s Elite Athlete Program. Congrats! Why are you running Austin in 2017? The Austin Marathon presented by NXP. Desiree Ficker Berry – Thank you. I’m excited to be a part of the revitalized Elite Athlete Program! I’ve been cheering for or running the Austin Marathon and Half Marathon since 2004. It is sacred to me and it’s always an enjoyable race. Unlike most, I absolutely love the hills. I train on the hills and live close to the course. I’m honored to be a part of High Five Events first year producing the marathon and want to help support your efforts. I’m at a point where my training miles can be increased because my kids are a little older (daughter Beau, 3 years old and son Bear, 14 months). When I see my kids on the course cheering for me, when I see the look on my daughter’s face, I know I’m inspiring her the way my parents inspired me. WD – What are your thoughts on the Austin Marathon bringing back a prize purse/elite field? DFB – It’s absolutely fantastic. Any time you introduce a prize purse/elite field it makes it more interesting for everyone. It enhances the race for the other elites because they know they’re competing against the best. Every participant gets to share the same course as the elites; it adds a little more motivation for them. In what other event can you participate with the top athletes in that sport? Lastly, it’s thrilling for the spectators. I grew up watching races and it’s a spectacle to watch athletes give everything they have on race day. WD – You’re originally from Maryland. Tell me, in 60 seconds or less, how you got to Austin. DFB – I grew up and went to school in Maryland. I then attended and ran for the Univ. of Alabama. Afterwards I became interested in and began competing in triathlons. I entered a triathlon training program in Colorado Springs, became pro, then moved to Boulder. I met some friends who needed a house sitter for four month in Austin. While in Austin I became friends with Jack Murray, swam with Longhorn Aquatics, ran with Gilbert’s Gazelles, and had my first taco in the red caboose at Juanita’s Tacos. WD – Who was your inspiration/role model growing up? DFB – I grew up in track and field. I’ve been competing in some form or fashion since I was four years old. We traveled as a family to international events as spectators. We went to Beijing, Italy, Seoul, France, Tokyo, and Atlanta to name a few. Those opportunities to see the sport allowed me to watch Jackie Joyner-Kersee. I’ve always admired her spirit. She’s always happy, smiling, and gracious. I loved the fact that she was capable of being successful at numerous events. I remember in an interview she said one of her keys to success was to surround yourself with positive people. I’ve strived to follow her lead, both as an athlete and as a human. WD – What was the catalyst that launched running for you? DFB – My first memories of running started around four. I remember feeling the speed and being in the moment. It felt like I was flying. I had so much fun and I wanted to keep that feeling going. My dad was a competitive masters runner. He was always training. In the winter he would take us to run at the Univ. of Maryland indoor facility. We would run stairs and I remember trying to beat my dad. Crossing the Jack’s Generic Tri finish – 8/7/16. WD – You retired from triathlons in 2011, yet you have raced in several events, like Jack’s Generic Triathlon, since. What drew you back? DFB – Basically, I missed the triathlon. From a physical standpoint, I was much healthier when I included swimming and biking in my training. I also missed the people, missed the relationships. I love the challenge of doing three events in one. WD – How is life post-triathlon retirement treated you? WD – You can choose one (race) distance to run the rest of your life. What’s the distance? DFB – The marathon; no question. When you’re fit and in great running shape, there’s no better feeling than being out there for 26 miles. You cover so much distance, see the beauty around you, feed of the energy from the crowd, and then the inexplicable feeling you get when you cross the finish line. I’ve always loved running because all you need is shoes and heart. WD – Do you run with a training group in Austin in preparation of the marathon? WD – Most people give advice to their younger self. What piece of advice would you give your future self for race day on Feb. 19th? DFB – Patience, grasshopper. With the crowd, the energy, the adrenaline, there’s always the inclination to begin quickly. Remain patient, take your time, take care of your body, take in hydration/nutrition, run your race. Most importantly, take care of yourself at the beginning so you’ll be ready at the end. WD – You’ve won or placed at all of the big Austin running and triathlon events. How does it feel to win or place where you live compared to winning or placing somewhere else? DFB – There’s a sense of patriotism towards your town, like hometown pride. The cheers are much bigger and louder. Any athlete will tell you they want to win where they live. It’s that much sweeter. Training Partners Bear and Beau. WD – How do you balance your family life, work life, and running life? DFB – It’s a balancing act, but one that I wouldn’t trade for anything. When my husband is on the road it is more challenging to manage workouts and my kids, but when he’s home I can get it done a lot easier. My kids have wonderful school programs, there’s a mother’s day out, great babysitters, and I push them in the double bob (stroller). My kids love it! We go on adventures and we always end with breakfast and a smoothie. WD – What advice do you have for mothers who want to run or are just starting to run? DFB – Think about how inspiring it’ll be for your kids to see you set a goal, work towards it, and achieve it, Remember to take time for yourself. Reward yourself in a healthy way. Don’t forget the importance of goal setting. Having a race on the calendar helps. 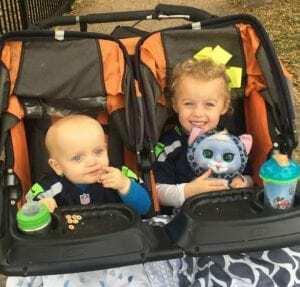 Running with a stroller can be difficult at first but you will become stronger and more accustomed to it. But know, when you race without the stroller you’ll fly through the course! WD – What has running given you? DFB – So many gifts! Running has given me confidence and strength. Running has given me experiences that I would’ve never had, like traveling the world to watch competitions and races. Running has given me a lot of joy, which is why I, like Gilbert, run with joy. Running is my main stress relief. My pregnancies were stressful and running was an outlet that reduced stress and made me feel better. Fit Fickers – Fit is Fun! WD – Give me an update on Fit Fickers. How is it coming along? DFB – We have two week camps every summer at St. Stevens, In 2017 they’ll be the second and third weeks of July. On 11/6, we finished our Sunday evening training group. That’s a six-week program where kids swim, then run at Quarry Lake. I love seeing the kids’ improvement. 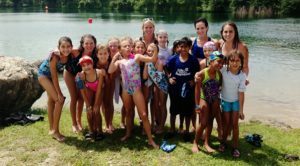 There have been kids who’ve conquered their fear of open water and become excellent swimmers. There are normally 15-25 kids/week and their ages range from 7-15. Coaching the kids is special to me; I love it. I’m giving them skills for life. WD – After the Austin Marathon, what’s next? DFB – I’m going to look at tri schedule and pick out a couple 70.3s. I want to get my pro card back, I want to get back to racing as a pro. I want to race NYC, California International Marathon, Texas Tri Series, and the Cap10K. 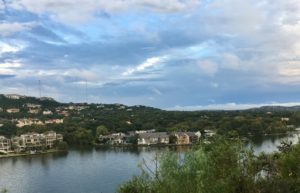 WD – Favorite place to run in Austin? DFB – Scenic Dr. The view of the Colorado River is something else. There’s something new every day. I have a mile loop that I love to run. Don’t get me wrong, I love the Town Lake trail, but Scenic takes the cake. DFB – Hiking with the family, taking my kids to the park, being outside in general. We love the Greenbelt. We enjoy visiting the parks around town and Texas State parks. Our favorite park to visit is the Terrytown Triangle Park. DFB – I’ve got to break this down into three categories. #1: breakfast tacos, Taco Deli; #2: weekend must, True Food Kitchen, Seaholm District; #3 old favorite, Galaxy Cafe. DFB – I’m glad I live in Austin because my dad wants to get BBQ and listen to live music. If my mother-in-law visits we go on a walk around Town Lake with the kids. It’s such an enjoyable place to be. WD – Des, thanks again for taking the time to swing by High Five Events HQ and lend your time. I look forward to hearing about your Austin Marathon training leading up to race day! We’re excited to have you and look forward to an amazing day. Best of luck with your training. I think it’s safe to say you’re now a role model for many. DFB – William, it was great to swing by HQ. I’m glad I finally got to see the new place! I’m glad y’all are bringing back the Austin Marathon’s Elite Athlete Program. I think it’s going to enhance the race and be a positive light for our sport. I’m sure all see High Five before race day, but if not, I’ll see y’all at the start line! Staying Vertical is an interview session with various individuals within the endurance community hosted by William Dyson, High Five Events Communications Manager. Staying Vertical will showcase the perspective of runners, triathletes, sponsors, partners, event producers, and volunteers to understand what makes them tick. We will highlight their involvement and give the endurance community an inside look into the individuals that are just like you and me. High Five Events is proud to announce the expanded partnership between St. Edward’s University and the Austin Marathon® presented by NXP. Two of Austin’s more recognized entities will work together to showcase the marathon’s economic impact on Austin by engaging faculty expertise at The Bill Munday School of Business. By expanding the partnership with St. Edward’s University, the Austin Marathon will have access to some of the top economic experts in the country, including Associate Dean, Ali Dadpay, who is leading the research for the economic impact report. The 2017 report will include High Five Event’s localized spending, volunteer contributions, jobs created, vendor and supplier additions, and sponsors’ spending. Like previous reports, how much money was spent by participants on hotels, travel, entertainment, and meals will be included. The 2016 Austin Marathon contributed $25.7 million to the Austin economy. About St. Edward’s University: St. Edward’s University is a private, liberal arts college in the Catholic, Holy Cross tradition with approximately 4,600 students. Located in Austin, Texas, it is one of the top universities in Texas and offers undergraduate and graduate programs, including MBA programs and a master’s degree in counseling. With a network of partner universities around the world, St. Edward’s is a diverse community with programs designed to inspire students with a global perspective. St. Edward’s University has been recognized for 14 consecutive years as one of “America’s Best Colleges” by U.S. News & World Report and ranks in the top 20 Best Regional Universities in the Western Region. For more information on St. Edward’s University, visit stedwards.edu/about. High Five Events, one of the largest privately owned event production companies in the United States, is thrilled to announce that Red Bull will be an official partner for the 2017 Austin Marathon® presented by NXP. The partnership will provide participants with Red Bull during their race day experience. Additional race day activations are still being planned and will enhance the finish line festival. The original Red Bull energy drink and Red Bull sugarfree will be available to all participants at the start and finish lines and at every aid station along the full and the half marathon course. Red Bull, first created 29 years ago in Austria, is well-known for their sponsorship of and involvement with sports, racing, and extreme adventures. In addition to product support throughout the course, the Red Bull team is currently working on additional audio and visual race day activations.